National Threatened Species Day this Sunday in Kings Square. Meet NURLA, Project Numbat’s cuddly mascot! Project Numbat is a not-for-profit community group helping to raise awareness and conserve WA’s endangered animal emblem, the Numbat. There is some great new music emerging for the Freo music scene at the moment. This hip hop clip by Koi Child won’t be everyone’s cup of tea but I enjoyed seeing this Freo band doing there thing with historic Freo as their backdrop. This may not be the sexiest post of the year but I was pretty chuffed that at our council meeting this week we adopted a new five year economic development strategy (the Fremantle Economic Development Strategy 2015-20). It builds on the positive momentum gained from our award-winning 2010-15 strategy. A number of objectives are outlined in the strategy including that by 2020 Fremantle will be recognised as a ‘Primary Centre’ under the State Government Directions 2031 planning framework. There is also a strong emphasis on attracting more people and investment into Fremantle by ensuring Fremantle remains unique in its offerings and that investors are kept informed of opportunities. Fremantle’s $1.3b development pipeline is great for the city but it does raise some challenges and needs to be managed effectively to maximize benefits in a sustainable way – this is what the new strategy hopes to achieve. Whereas the previous strategy was mostly about addressing Fremantle’s economic decline at a macro level and finding ways to reverse this trend, the new strategy, while still factoring in key macro issues is geared more towards providing support for the local economy and dealing with local issues at a time of great change. With this in mind, creativity, innovation and knowledge-generation are definitely a focus of the new strategy and we aim to help local businesses and industries foster these attributes to develop a smarter and more resilient local economy. We are showing our commitment to this aim by making its assets available for creative industry businesses, including the Naval Stores at Cantonment Hill and the Old Boys’ School in Princess May Park. As a whole, the vision outlined in the new strategy is for a robust and continually-evolving local economy with flourishing businesses, high-quality property developments and a satisfying visitor experience. Last week’s Liveable Cities Forum that I presented at Rosie O’Grady’s was to kickstart the lecture series hosted by The Fremantle Network and The Fremantle Society. I have written a response to this that that was published in the Fremantle Herald today and you can read here. There wasn’t room to cover all of John’s often inaccurate assertions though and I have had a few emails asking for a more detailed response so here are some points of clarification. JOHN DOWSON: The wraparound promises $1.3 billion of development, though Dr Pettitt’s advertising admits only $16.2 million has been delivered after six years of his mayoralty. RESPONSE: While $16.2 in the value completed projects in the last couple of years (not the last 6 years as John incorrectly asserts) there is $269.5 currently under construction and a further $376 million of approved plans about to commence construction. I don’t think any reasonable person can argue there is not a major wave of new developments underway in Fremantle. In fact the title and next paragraph (below) of John’s article acknowledges development is on the rise in Fremantle. JOHN DOWSON: To get the development boom under way, the mayor and councillors trashed a perfectly good town planning scheme to allow developers large increases in height despite opposition from the majority of the community. RESPONSE: Yes the Fremantle Council under my term as mayor did raise heights in key areas away from the important and historic West End to encourage new investment in Fremantle (see map below). Yes it was controversial at the time but I believe that most Fremantle people understood it was necessary. The fact that all of the council members that supported these changes were re-elected at the last election suggests there was not opposition from the majority of the community as John claims. I still think we made the right decision here. JOHN DOWSON: Some of the big box proposals were in the West End conservation area, so the mayor simply reduced the boundaries of the West End, despite a $50,000 expert report stating the boundaries should be expanded. RESPONSE: This is incorrect on a number of levels: John as a former Fremantle Council member knows full well that the Mayor cannot unilaterally make decisions without the support of the majority of the Council. More fundamentally, the Fremantle West End Conservation Area Policy (D.G.F14) which can be found at http://www.fremantle.wa.gov.au/cityservices/Planning/Policies has not been changed since the 1990s nor have the West End Boundaries. In fact the City of Fremantle is working with the State Heritage Office to get the West End of Fremantle state heritage listed for the first time. Page 10 of this states that the West End zone is: “the area bounded by Little High Street (west), Collie Street (south), Market Street (east) and the railway line to the north.” This is what we are seeking state heritage listing for so John is not correct in this assertion. JOHN DOWSON: Instead of setting the example and maintaining its own heritage properties (your assets), the council has allowed them to run down to a dangerous degree. It has been unsafe for years to fly the Australian flag from the Town Hall, for example. What recent work that has been done by the council has often been highly controversial — replacing copper guttering at the arts centre with plastic, putting a tin roof on the 1854 boys’ school, and doing repairs to the facade, which have collapsed, at the historic Fremantle Markets. RESPONSE: As I said in my Thinking Allowed we need to let the facts speak for themselves on this. Over the next year Fremantle Council is spending more than $7 million on a range of heritage projects including restoration work at the Fremantle Boys School, Fremantle Markets, Evan Davies Building (a.k.a. Dome), Fremantle Oval, Gil Fraser Reserve grandstand (North Fremantle), and the Fremantle Town Hall. This is a record investment in heritage projects by a Fremantle council and will begin to address the generational backlog of heritage maintenance work. In fact, over the past few years this council has spent more than five times as much each year on heritage maintenance than was spent during John Dowson’s time on the Fremantle Council. That’s right – more than five times as much! It is true that a tin roof is replacing the asbestos shingles on the 1854 old boys school because a tin roof is what it has had most of its life (see photo below from 1911). We have unfortunately had to replace some stolen copper downpipes with copper painted plastic ones as the high price of copper meant thieves were damaging the arts centre building as they pulled the copper downpipes off. This is a pragmatic and sensible response and when copper isn’t such a sought after commodity we can then put these back in place. JOHN DOWSON: Sadly, the West End of Fremantle, an internationally famous jewel, revered as one of the most intact 19th century port towns in the world, is now in grave danger from overly large and mediocre developments approved by the council at sites like Atwell Arcade and 8 Pakenham Street — and now 7 Henry Street is at risk of the same treatment. Precedent is everything in planning and the scene is unfortunately set for increased heights and more characterless new buildings in the West End. RESPONSE: The heritage planning policy for the West End is still in place and offers strong protection for development in this important area. I actually think new developments in this area have largely been sensitive and appropriate. Take for examples Notre Dame’s recent developments by the late but award winning Marcus Collins, Bread in Common, the Rialto Apartments on High Street and the new MSC headquarters almost finished on Cliff Street. These are all excellent. I think the Quest Hotel and Atwell Arcade redevelopment will be far better outcomes that John fears and will see the heritage fabric of these buildings restored. JOHN DOWSON: A few years back Fremantle council and the community fought hard against the overscale ING proposals for Victoria Quay and demanded the masterplan be implemented. There was leadership from politicians like state member Jim McGinty and federal member Carmen Lawrence against “a disproportionate box stuck on the quay” (Jim McGinty, April 2006). But, here we are in 2015 with the current council and local politicians supporting a larger commercial development on Victoria Quay than ING, one which will probably house the 1000 government workers the council has designed its King’s Square plan around. RESPONSE: The 2006 ING proposal rightly deserved to be opposed by the community and the Fremantle Council. I personally opposed it. The more recent plans are far better than the inward looking ING proposal. It potentially offers good connectivity between the port and the Fremantle CBD and retains all of the heritage buildings. This is why it had broad community support. JOHN DOWSON: The council’s business plan for King’s Square states, “the project derives a positive net present value to the city (enhancing community wealth)…”.However, independent assessments claim $30 million of community wealth is actually being destroyed. Urbanism without effort, what can Fremantle learn? The Committee for Perth, the City of Fremantle and the University of Notre Dame invite you to attend a free Future Freo public forum with special guest Chuck Wolfe author of Urbanism Without Effort. Chuck Wolfe is a Seattle dwelling attorney focused on environmental and land use law. He assists in the successful redevelopment of infill locations and applies the use of sustainable techniques and innovative regulatory tools. His book Urbanism Without Effort offers an alternative approach to understanding cities and emphasises the importance of urban history and the organic city. In order to have successful urbanism Chuck believes that the oversubscribed focus on placemaking, planning and population specifics must be replaced with an understanding of those elements that have authentically evolved over a city’s history. It is only when this has been achieved that solutions can be prescribed for cities, based on context gained through personal observation. Following the presentations there will be an opportunity for a Q&A followed by networking and refreshments. 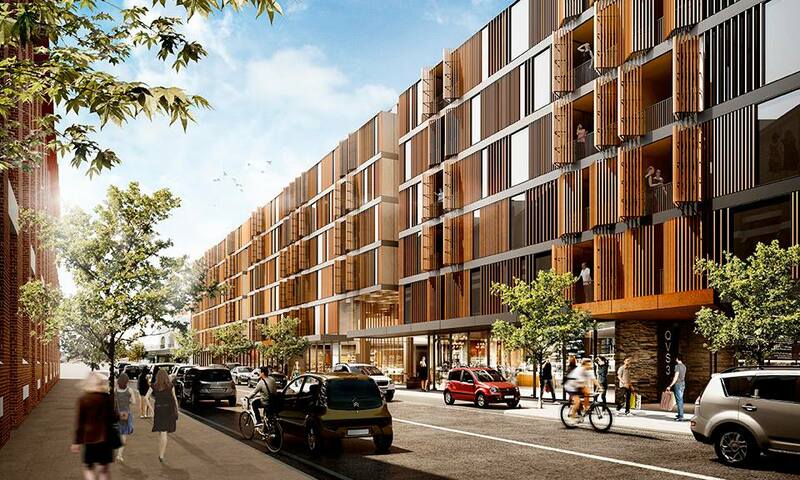 The Freo Herald just posted this snappy picture the new Defence Housing Association development proposed for 166 apartments on Queen Victoria Street in Fremantle’s East End. The development is on the 4754 sqm former Toyota site and will also include 1325 sqm of commercial space. Another good part about this Defence Housing Association development is that it is pre-financed so will happen quicker than most. Opposite the Heirloom Wolstores development and will help complete that street nicely. It will apparently “feature three separate buildings; one of seven-storeys facing Queen Victoria Street and two four-storey buildings facing Quarry Street.” Defence representatives will be in Kings Square on Friday September 4 between 3-6pm to show the plans.